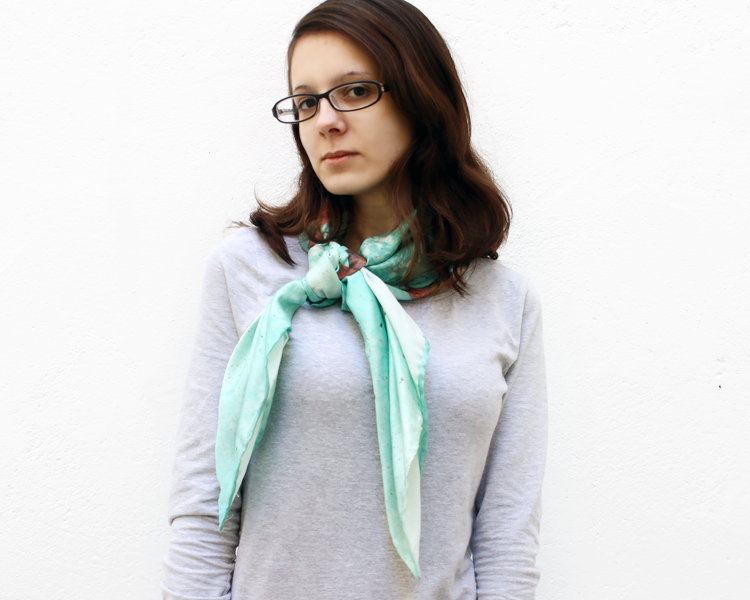 So I made this pretty scarf. I ordered the fabric in November for a customer, and it never arrived, and it had to be reprinted, so it was quite a while before I could get my hands on it, but eventually it was here, and it was gorgeous, and I made a scarf with it. I spent two days fighting unruly thread and learning my way through hand-rolling a hem. 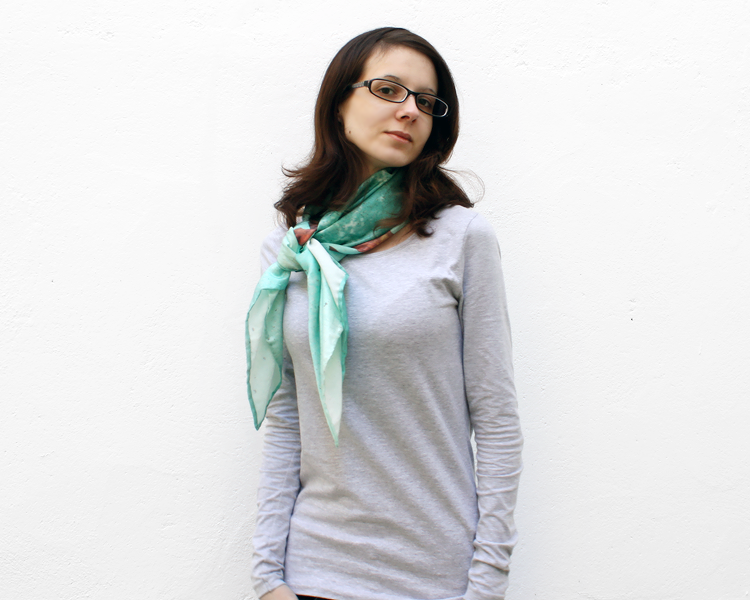 …and I realized I didn’t have the faintest idea how you’re supposed to wear a silk scarf. 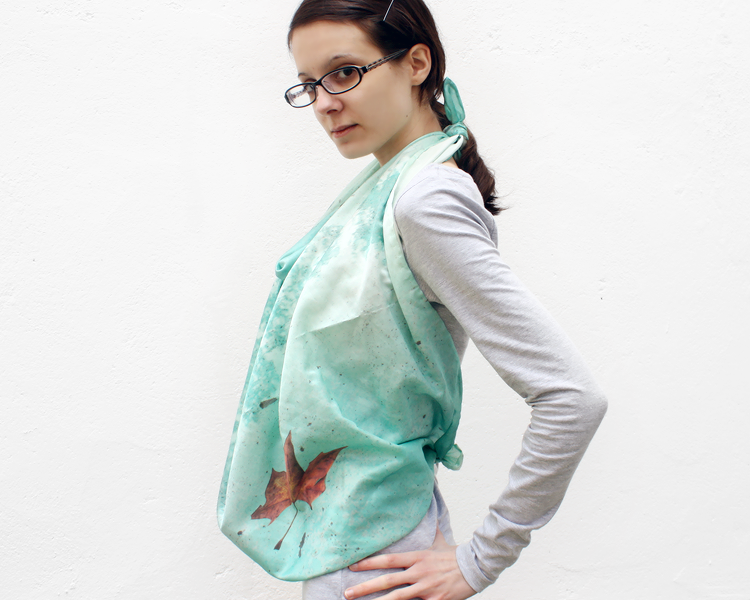 A square silk scarf, to be specific. Actually, a square cotton silk scarf, but the problem was the square bit. I have plenty of long, mostly knit and crochet, scarves that I can do super crazy things with (that I also learned on the Internet), but I’m not a silk scarf person — I wear scarves to keep warm and silk has always felt weirdly in between — too warm and too cool at the same time. I have to say, though, after researching it? I could be into silk scarves as neckties. Every other way I included here, though, is just for show. 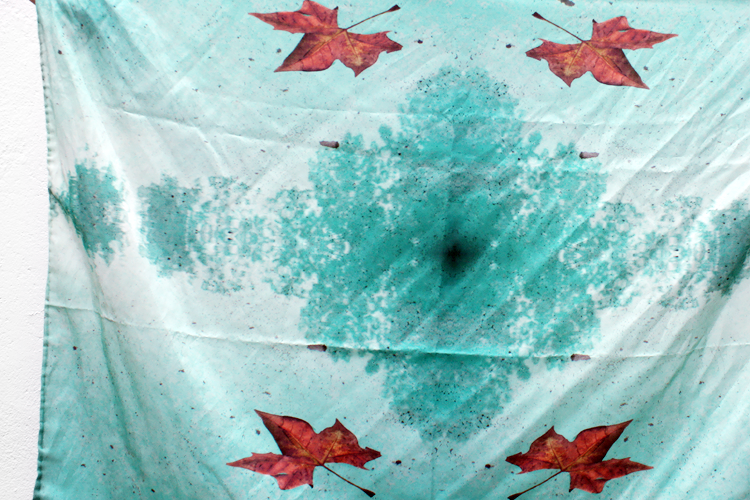 Cotton silk from Spoonflower printed with Adrift, a photograph I took of an autumn leaf floating on a fountain on the way up to my library. Handmade with a hand-rolled hem. Approx. 34″ x 40″ in size. Not yet available for sale — unless, of course, you reach out to me personally. 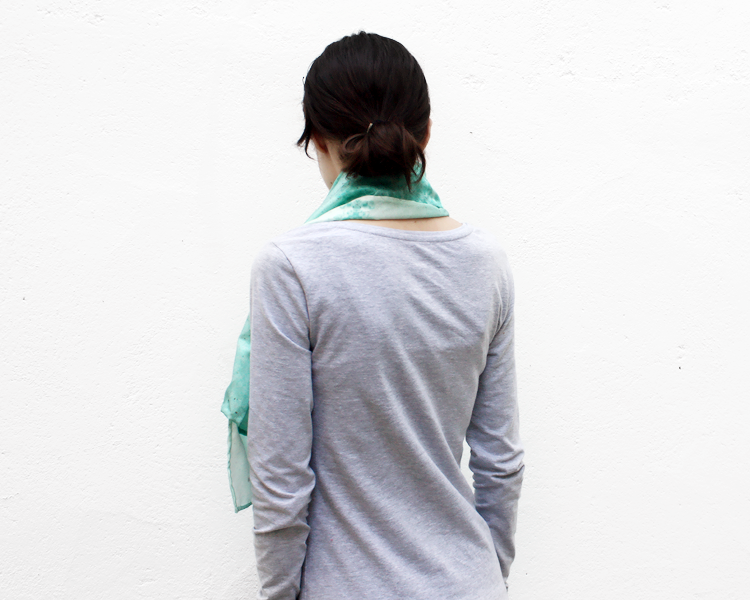 Pre-order price is $75 for cotton silk and $110 for silk crêpe de chine. 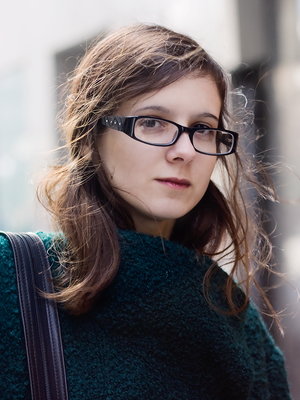 In these photos, I wore it with a light gray long-sleeve top from C&A and my everyday black glasses from Zennioptical. 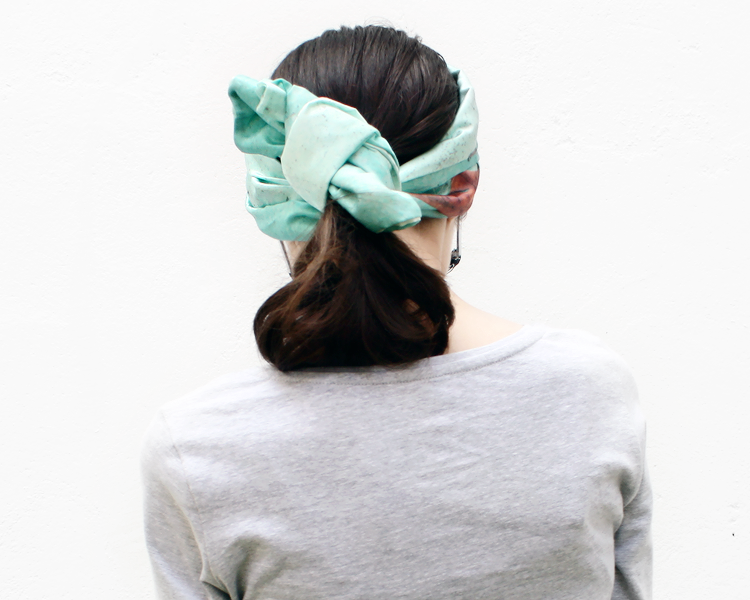 Do you own any silk scarves? What’s your favorite way to wear them? What great timing! I just added a beautiful new scarf to my collection that I bought at a horse show last weekend. I love to check out the Brooks Brothers scarf tying tutorials all the time, but once I decided to rope my pearls around my scarf into sort of colorful scarf/pearl necklace combo and I LOVED IT. There are some great videos here on how to tie them, too. I’m jealous that you can make these yourself! Ohh, that sounds brilliant! I love how mine turned out but I don’t know how convenient it is that I can make them since the custom fabric is so expensive, haha. That scarf is absolutely beautiful! The colors are so lovely! Beautiful! I’ve always liked the way scarves look on the rack, as it were, but have never really figured how to wear one properly. 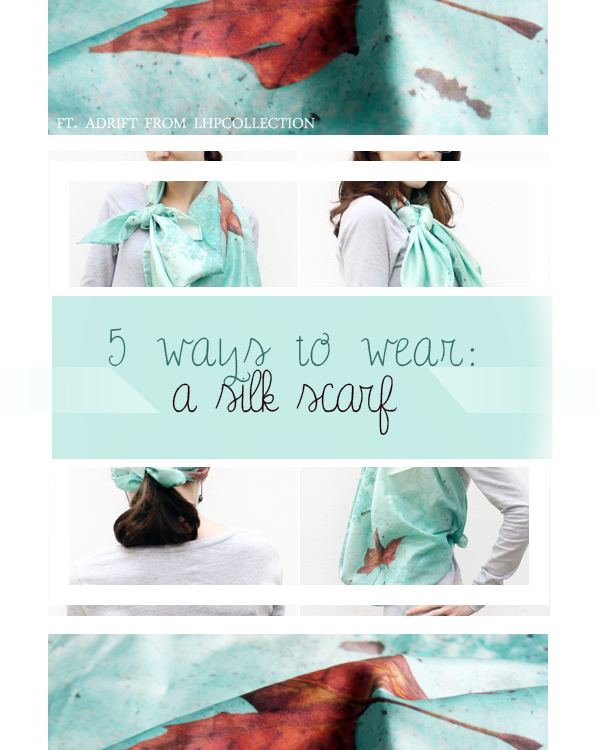 Number four is my favorite… and your scarf is just fabulous! color choice just fantastic! I’m collecting scarves from everyplace I travel… I even have from London… little bit “cheezy – commercial” … but I love it anyway. Thanks for sharing! Thank you! I really love how it turned out. I don’t collect anything but I’ve amassed a number of scarves since I started selling on Etsy – trading will do that to a girl. 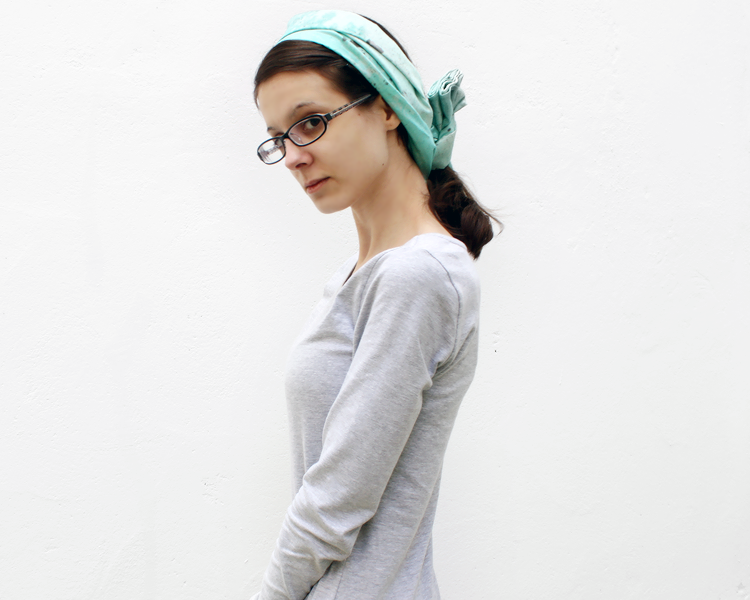 :P My most recent acquisition was a super long dark gray stretchy cotton scarf printed with a Jane Austen quote. I love it. 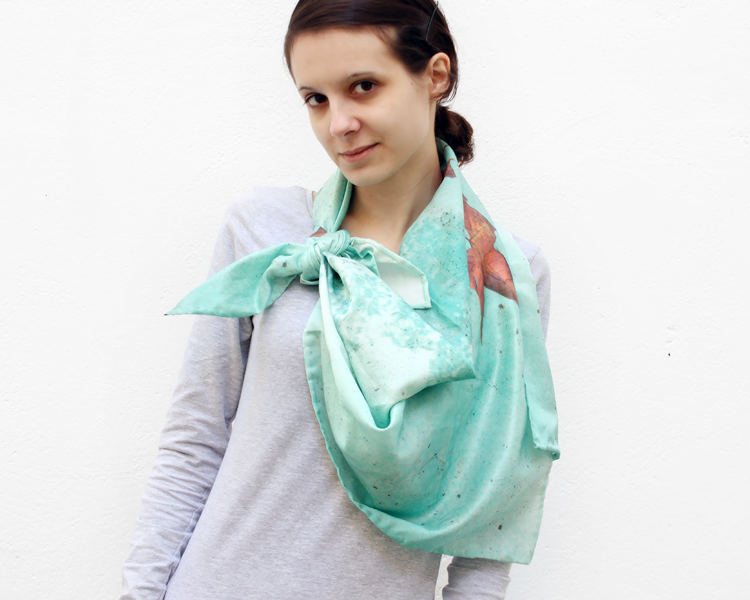 Lovely scarf! I love how many options there are for scarves…these are all completely different than the ones I posted! I love all ways how to wera it! And great scarf I have to say!